Sib Icon Editor v5.12 | Free eBooks Download - EBOOKEE! Posted on 2013-05-03, by ebooksfree. 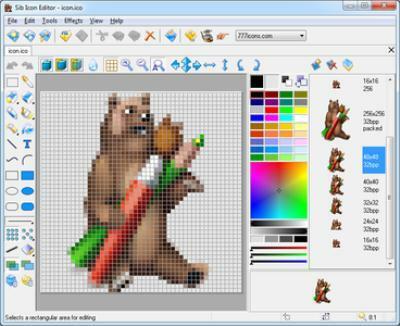 Sib Icon Editor lets you create and edit PNG-packed Windows icons; icons in either standard or custom sizes, in color depths up to 16 million colors; icons for Windows XP in 32-bit color depth with 8-bit alpha channel. It offers a professional level workshop for designing the icon structure of your Windows. Want your system outward appearance to be more eye-appealing? Sib Icon Editor has a knack for refining your system interface! Here you will be able to paint images with gradient and chess fill and modify images with drop shadow, opacity, smooth, negative, grayscale, colorize, hue/saturation, color replacement, rotate, roll and mirror effects. A variety of graphic formats are available: you can open and edit ICO, ICPR, BMP, JPEG and PNG images, or you can export your creation to ICO, ICPR, BMP, JPEG and PNG files. Besides, in Sib Icon Editor you will find some pleasant features that greatly widen the comfort of the program``s use: ability to sort images inside icons and icons inside libraries, ability to customize Windows Desktop and folder icons. The program will let you drag and drop files from file shells or icons between different libraries. No comments for "Sib Icon Editor v5.12".